Last weekend I needed to do a little cleaning in our refrigerator since we tend to forget things and then some new science project starts to happen, ewww! I forgot that I had a couple of oranges and thought what can I make with oranges hmmmm. I love to challenge myself ( who knew!) so I found in my fridge that was needing to be used soon Ricotta cheese,and oranges what can I make with the two combined. I came across this recipe Orange Ricotta tart with Chocolate ganache from the baked by an introvert blog. Believe me when I say I have never made a tart before so I was a little hesitant to start this, but once again I love a challenge. It certainly was not hard to do at all , and I do have a confession I am terrible at making crust for pies so when I made the crust for this tart it turned out perfect! The Filling part was easy and simple, but to be honest from the recipe that I followed if I had to change it I would a little bit by adding an egg to the mix to make it fluffy since without that egg the recipe was more crust then filling to me. I would also suggest orange extract is fine to use, but if you want more orange flavor use the juices from the oranges that you have it really brings out the natural flavor of orange in the desert. I also would add 1/3 cup of ricotta cheese to the 1 cup that the recipe calls for , once again to make it a little more filling added to the tart. For the Chocolate piece I used dark Chocolate it certainly made this a rich flavored tart, and if you are like me a Chocoholic then this would be perfect for you Bone appetit! 4 ounces semisweet chocolate, chopped fine I added more Chocolate but that is because I am a chocoholic. Make the crust: In a medium bowl, cream together the butter and sugar, until fluffy. Stir in the salt and vanilla. Add the egg, beat until well blended. In a small bowl, combine the flour and baking soda. Stir with a whisk. Add flour mixture to butter mixture 1 Tbs at a time. Toss with a fork until a soft dough forms. Gently knead the dough until it sticks together in a ball. Shape the dough into a disk. Wrap in plastic wrap. Refrigerate for 1 hour. Preheat the oven to 350F degree. Grease and flour an 8-inch springform pan. Place wax paper in the bottom. Press the dough out into the bottom of the pan, press up the sides of the pan about half way. Make the filling: In a medium bowl, cream together the cheese and butter. Beat in the sugar, salt, orange extract, and orange zest. Beat in the flour until well blended. Spread the mixture into the bottom of the crust. Bake for 25 minutes. Set pan on a wire rack to cool. Remove the tart from the pan. Make the ganache: Place the cream and corn syrup in a small saucepan. Heat over low heat until cream begins to simmer. Remove from heat. Add the chocolate, stir until the chocolate is completely melted. Let the ganache cool. Pour it over the filling, used a silicone spatula to spread the ganache evenly over the tart. Refrigerate for 1 hour before serving. © Sweet and Sassy and oh so crafty – All photos and content are copyright protected. Please do not use any photo without prior written permission. If you wish to republish this recipe, please rewrite the recipe in your own words and link back to this post. I love me some Chocolate Chip cookies especially when they have a lot of chips in them hmmmm chocolate! We have an old recipe in our family it is pretty simple recipe, but I have got to tell you it is the right amount of time you bake them and the right amount of chips you put into them that make them so delicious and such a comfort treat. As a little girl I loved helping my mom whip these up and bake them, but the fondest memory I have really is baking these cookies with my sister Melissa. We use to call her Cookie Monster because she loved Chocolate chip cookies always wanted to make them . Now Forward to my Teen years it was the summer of 1989, and I really wanted to bake so bad, but this time I wanted to experiment see what I could do to change up the hand me down Chocolate chip recipe in my family. I decided to get into my mothers liquor cabinet checked out what I could add to this batter to make it rich tasting. I found my mom had Kahlua and De cacao hmmmmm thinking in my head this could be a hit! The rest was history my mother’s boyfriend at the time loved them, and so did my high school friends. this became my new signature recipe. I have now handed this over to my mother and my sister Val, well I had to hand it to my mom she kept asking me what I did to make everyone like it so much. I gave her a hint that I got into her liquor cabinet ( Yes I did get into trouble and had to totally convince her that I got into the cabinet to use liquor for baking not to drink it Geesh!) I finally gave in and she was thrilled. Here is my recipe to share now I do not measure certain ingredients, but here is a clue Kahlua and De cacao brings out the intense Flavor of the Chocolate Chips as does the brown sugar. These cookies are even good with home made ice cream, but that is another day to share so enjoy. 1 1/2 cups of gold medal flour if you need to add a little more flour seeing your batter might be a little runny I usually will add about 1/4 cup. 1/2 tsp of baking soda, 1/2 tsp of salt and 1 package of 6 oz of Semi sweet Dark Chocolate chips ( I use Ghiradelli 60% Cacao) and really it does not hurt to add more chips the more the better right? First mix Shortening, egg, sugar, brown sugar, vanilla, and the Kahlua, De Cacao together make sure the batter is a smooth look no lumps in it. next Measure the flour by dipping method or by sifting, for a softer rounded cookie add 1/4 cup more flour. Mix the dry ingredients together, last mix the chocolate chips mixing evenly. Drop Teaspoonfuls of dough about 2 inches apart on UN-greased baking sheet. 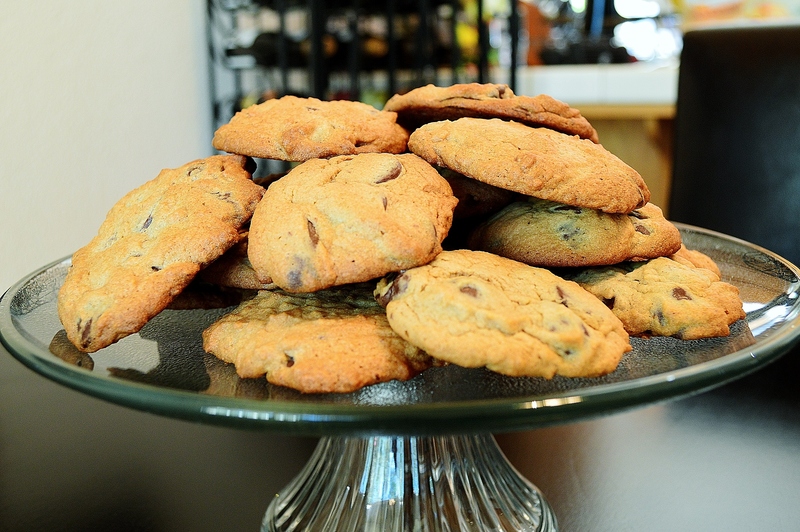 For me I like to use a tablespoon of the dough and I place them on a non stick oven mat from Martha Stewart it makes baking so much easier and really your cookies come out a little softer. Bake 8 to 10 minutes or until delicately brown now this is the important part if you like crunchy then 10 if you like that soft gooey kind of cookie then 8 once again it depends on your oven not everyone’s oven is the same. Experiment and you will find the right amount of time to bake these.